Old wine in a new bottle and all that - some bread recipes are so simple and uncomplicated. When I have one of those last minute orders, this is the recipe I use. If the filling sounds familiar, it's only because it's similar to the one that's used in garlic bread- you know - slices from a baguette that are spread with garlicky butter and finished off under a grill, or whichever way you make garlic bread. For the filling, I've used garlic paste, parsley and butter. This time, I decided to bake them in muffin pans so the edges would be neater. If you're using a stand mixer, fill the bowl with all the ingredients except the water. Switch on the mixer and slowly trickle in the water. You may not need all the water so do go easy with it. When the dough is formed and well kneaded, remove it from the bowl, grease the bowl and put the dough back in. Cover the top with cling wrap and allow the dough to proof till double in size. Remove the dough from the bowl onto a work top and knead, adding more water only if necessary. When done, place in a large greased bowl, cover the top with cling wrap and allow the dough to proof till double in size. If you are going to make the dough with sheer muscle power, place the dry ingredients into a roomy bowl. Make a well in the centre, pour in the oil and about 3/4ths of the water. Work the ingredients till they combine into a dough. Remove the dough onto a worktop and knead it well, adding more water as necessary. When done, place in a large greased bowl, cover the top with cling wrap and allow the dough to proof till double in size. While the dough is proofing, grease a 12 hole muffin tray and keep it aside. Mix together the filling ingredients, except the cheese, till well blended. When the dough has doubled in size, punch it down and knead it briefly. Place the dough onto a lightly floured worktop, press into a flat disc and roll out into a 18' x 12" rectangle. Spread the filling all over the dough evenly, sprinkle the cheese over it. 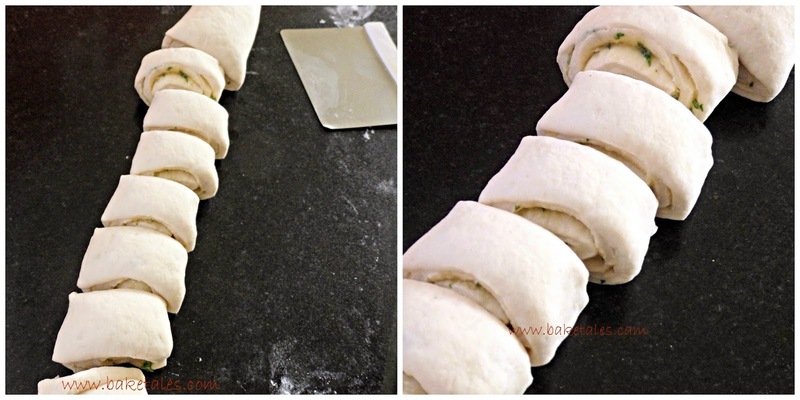 Roll up the dough into a fairly tight roll, cut it into 12 even pieces. Arrange them in the centre of each hole and leave to prove for another 20 minutes. Bake at 200°C for about 12 minutes, till golden. Remove the pan from the oven, brush tops with a little extra butter. Remove from the pan and leave to cool on a wire rack (if you have that much willpower) (!! ).